When Alma at The Tablescaper announced her link party entitled, Where Do You Keep it All? Part 5 I knew I wanted to participate. I thought it would be eye-opening to me to really evaluate where I have been storing all my tablescaping items. I'm fairly new to the hobby (my Blogaversary of One Year won't be until September), but I've LOVED plates and crystal for forever, so my collection had a pretty good head start. I've got to tell you, this post has totally inspired me to get a handle on my organizational flaws!! When I took an honest look at the pictures I had taken, I thought, "I can't possibly post these pictures on my blog! It's too embarrassing! Even if all my storage areas are surreptitiously hidden behind closet doors, others will look at the chaos and enter my name as a contestant on the show, Hoaders: Buried Alive! But, I'll take a chance, and if nothing else, please know this blog entry will hopefully serve as a "BEFORE" series. Stay posted for the "AFTER" series of photos when I can come up with a better system. So, here goes! Before we did renovations about ten years ago and added a new kitchen, dining area and family room (better known as a Great Room), we had a small dining area off a small galley kitchen. I had an antique cabinet I called my sideboard where I could store linens and placemats and use for additional serving space during a holiday dinner. 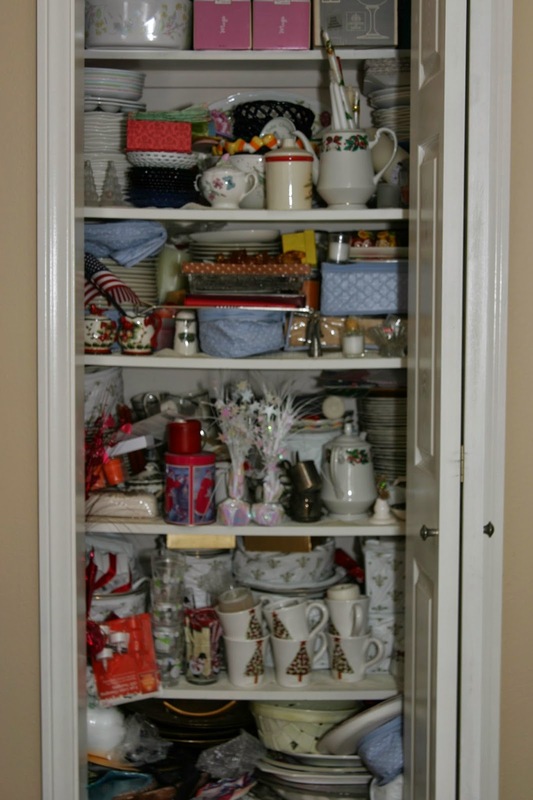 I had one closet that served as an appliance garage and held the zippered china storage sets with my "good" china and Christmas dishes. I also had a corner cabinet that served as my "hutch". This held some serving pieces and my crystal stemware. Here's how the corner cabinet looks today where it's been relocated to my living room. I have collectibles in it now, and some crystal and porcelain serving pieces. The original appliance garage now has shelves added for stemware storage. It is also sorely in need of re-organization! 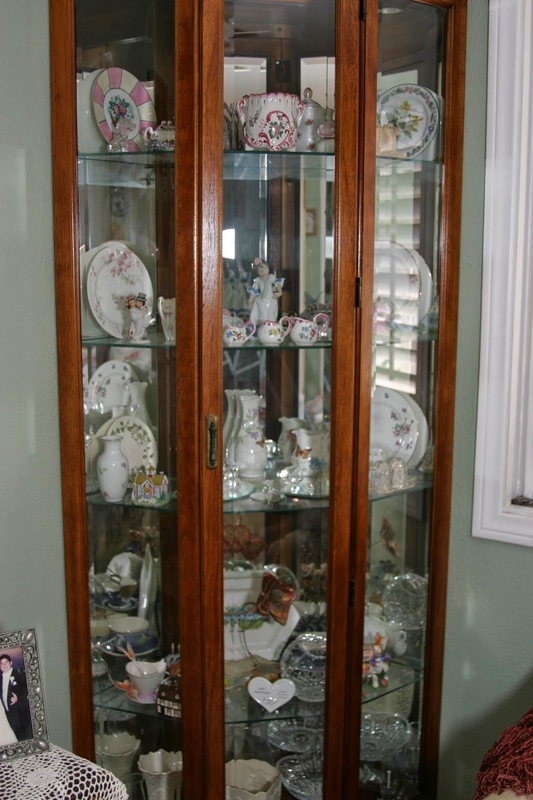 This is the hutch that is a part of the dining set we purchased after our new dining area was added. The top section serves as a display area for holiday and season changes (and also adds some badly needed space for plates and crystal. Flatware, linens (tablecloths and napkins) and accent pieces for my tablescaping are stored in the bottom cabinets. I then had to look at the desk unit for additional storage and started adding tall pitchers, teapots and faux flowers to my collection of family photos! Finally, I got some plastic bins for the overflow (they are located UNDER my desk unit!) I recently found these handled baskets at the Dollar Tree store. They work perfectly for my flatware. Now I want to find a way to close off this storage area. Any ideas? I thought about curtains on spring rods as well as some type of shutter. I now have filled up the room except for one other area: my book cabinets (remember: they're still full of teaching materials!) So.....I have to make some decisions. The elimination of these remnants of my teaching career is a daunting task. I keep thinking...what if I want to tutor? what if my grandkids need extra learning support? what if....what if.....? Bottom line is I have to be willing to "LET IT GO!! LET IT GO....."( start hearing the swelling of an orchestra and the voice of Idina Menzel!) It's so hard to say good-bye to these things that filled my waking hours for so many years. But, there is no where else to turn for storage. So----this is where I store my tablescaping items, and where my future "dish room" will be. Like I said, please consider this post a BEFORE glimpse. Hopefully, once life calms down a bit, I can work on the AFTER product. I still keep my eyes open for successful storage unit ideas. That is why I am looking forward to Alma's link party. I'm hoping I'll see what other tablescapers have done to keep their stash under control! Any suggestions you can offer are appreciated. Just leave a comment and I will take your suggestions to heart! and Dawn's History and Home Link party at www.wecallitjunkin.com Thank you, Alma and Dawn for hosting these parties! 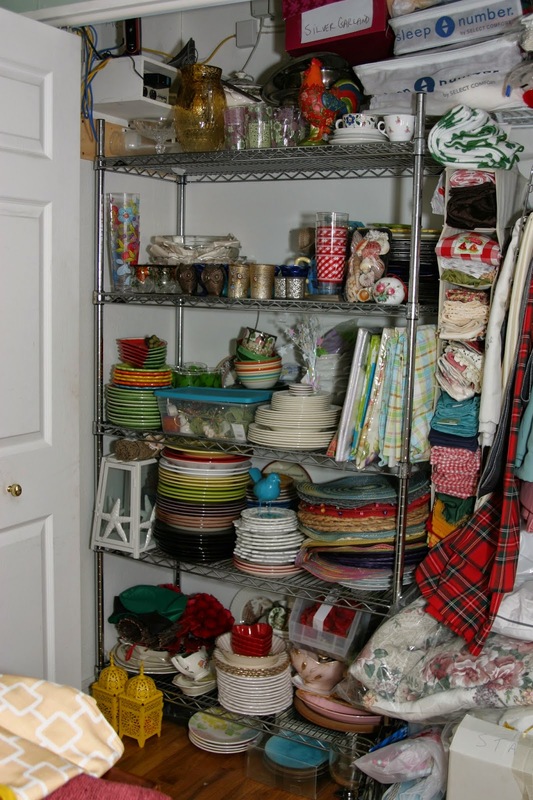 Rosie, I love seeing and reading about everyone's tablescaping storage (problems). 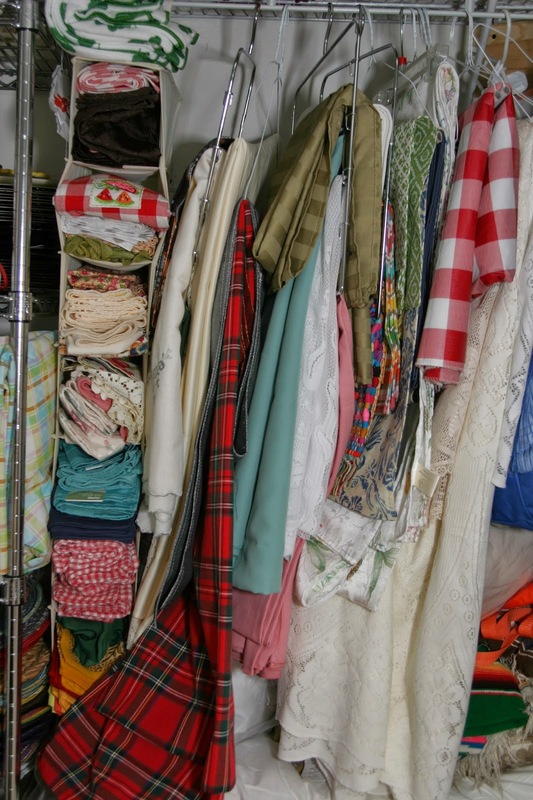 I would love to have your closet, I have mine here there and everywhere, but am slowly getting it all in one area. I have been buying a few see through rolling drawers and totes each week for napkins, flatware and napkin rings. I have a huge thing for napkin rings...I can't seem to pass them up when I see them! I just started my tablescaping/blogging adventure last year and can totally relate to your story! It's so much fun to peruse resale shops and antique malls to find table treasures. However, they started to pile up everywhere. I wasn't brave enough to share my other storage area ... maybe next time. I bought two of those metal storage racks from Aldi's. They help but I'm thinking I might be needing another one soon! Thanks for sharing your storage ideas!! Wasn't this fun? You asked about ideas on how to hide that bookshelf in your daughter's former room? A decorative folding screen would work out really nice! Easy to move, pretty, and you could even get the kind where you can display family photos on it! I understand not wanting to get rid of the memorabilia from your teaching years. I feel the same about my event planning stuff, although I'm pretty certain I'll never go back to that. I'm getting closer and closer to being able to let it go, though, as my need for storage increases! :-) I've started scanning some of it into my computer so that I can get rid of the paper clutter. Lots of work, but it's a compromise! You have a really impressive stash! Good luck and have fun with your rearranging plans! Trust me you are not alone in your lack of storage. I still have piles of stuff that need to be put in a home. But there never seems to be enough hours in the day...Love seeing all your dishes and goodies. It makes me want to shop for more! Oh Rosie I laughed and I cried as I read your post. We are living the same life! I did get rid of ninety percent of my work papers but I can't seem to let go of my college papers. Oh Dear! I am still working, in fact I am back to working full time now and way to many extra hours to boot. I had been playing tablescaper since I first came across Susan's Tablescape Thursday when when my employer closed our Ohio office in 2009. I looked for a job for over a year. During that period of time I drooled over all of the beautiful tablescapes and all of the wonderful blogs I came across during that year. I have filled my closets, my spare bedroom, and the garage with plates, glassware, candle holders and all of the other paraphernalia for tablescaping. I now have three full china cabinets and a buffet in the living room and dining room plus a china cabinet in the garage. I had wooden (particle board) cabinets in the garage but they succumbed to the water that came into the garage when the area was flooded last month. I have not blogged since, I am just trying to tread water myself to keep up with all of the "normal" stuff in my life. I started my blog last August when I thought I would be retiring. The point being, you have my sympathy. I do understand.... it all just gets away from you. You are right about the solution - organization. When you get a handle on it and are ready to post your "after" pictures I hope I will be able to say that I managed to become organized too. Oh my Rosie! I should show my husband your pictures before he complains again about all my china! haha! You are brave to show us your mess, but we all have it, and worse!! good luck, and I know how hard it is to get rid of teaching things and all those memories! There simply is never enough storage! I admire you for tackling this and sharing! My problem is that I know where [most] everything is, but it is not in a neat and tidy arrangement...bins helter skelter everywhere! Storage is always a problem! Thanks you so much for sharing as we all struggle through!! !